The New Haven People's Center is effectively the HQ of the Connecticut Communist Party. The New Haven People's Center operates out of 37 Howe Street in New Haven, Connecticut. People's World, the official newspaper of the Communist Party USA; Unidad Latina en Accion/Workers Center; Connecticut Bureau; and Knowing God Ministries also operate from this location. The organization describes the building as a "Meeting place of labor, community, peace and social justice groups". The Milada and John Marsalka Research Library is a non-circulating library of books and national and international pamphlets dating back to 1900. The topics include literature, the labor movement, Marxism, civil rights and history. The volumes, pamphlets and some periodicals and archives were donated from the personal libraries of those who participated in the Peoples Center over the decades. Volunteers assist with the cataloguing of the materials. It was standing room only Dec. 9 2001 at the New Haven People’s Center as an array of activists from across Connecticut came out to honor four leaders and celebrate the 82nd anniversary of the Communist Party USA. A greeting book and other contributions raised $3,500 to complete the $10,000 Connecticut fund drive goal. In her welcome remarks, Joelle Fishman, chair of the Connecticut Communist Party, cited the victory of the Charleston Five to emphasize that this is not a time for despair, but a time to stand up, speak out and collectively win new gains for peace and justice. Remarks by the honorees reflected the issues affecting working people and the world after Sept. 11 and in the midst of the economic crisis. They included: Pearl Granat, a veteran Hartford union leader and now a vice president for Local 1199 New York; Teresa Younger, the first African-American and first woman executive director of the Connecticut Civil Liberties Union; State Representative Evelyn Mantilla, a leader for an End Child Poverty Social Investment Fund; and Dr. David Adams and Lindsay Mathews, who returned to Connecticut after a decade in Paris where David worked for UNESCO as director of the International Year for the Culture of Peace (2000). The pro-labor, pro-people’s message of the reception was highlighted with a call to support Pratt and Whitney workers on strike at four Connecticut plants. About 100 labor and progressive activists packed the New Haven People's Center Dec. 5, 2004, to celebrate the 85th anniversary of the Communist Party USA at a reception hosted by the Connecticut Bureau of the People’s Weekly World. Several state leaders in the movement for social change were honored, including Sharon Palmer, president of the American Federation of Teachers in Connecticut, Americo Santiago, program and policy director of DemocracyWorks, and the Rev. Scott Marks, New Haven director of the Connecticut Center for a New Economy. Palmer, who coordinated labor’s activity in the 2nd Congressional district, spoke of being depressed at first after election results came in, then becoming angry and finally determined to continue the fight against the anti-labor, anti-people policies of the right-wing. Santiago, who initiated a successful campaign to restore voting rights to ex-felons, said grassroots activism has never been more vital than it is today. Rev. Marks delivered a powerful call to continue organizing door-to-door and developing new leaders to bring about change. Sam Webb, national chairman of the Communist Party USA, emphasized the need for unity to continue to fight against the Bush administration’s greedy schemes to strip working people of their hard-won Social Security benefits. The spirited celebration was a reminder that “We, the People,” will not sit still and let the ultra-right roll over us and try to take our dignity and respect away. It included calls for educating, organizing, and mobilizing others to save Social Security, to win health care for all, and to end the war in Iraq. The event included a program and greetings book that raised nearly $3,000 for the People’s Weekly World, putting Connecticut over the top for its goal in this year’s fund drive. "A New Generation of Dreamers - Freedom Rides Yesterday - Freedom Rides Today" was held at the New Haven People's Center Sunday, February 27 2011. Our 37th Annual African American History Month Celebration takes place 50 years after the Freedom Rides by young people who traveled from the North to desegregate the South. They were beaten and jailed but they did not turn back. Their courage helped win passage of the Civil Rights and Voting Rights Acts. Today we face new challenges of racism and violence and a new movement for equality and social justice is coming forward. "A New Generation of Dreamers. Freedom Rides Yesterday - Freedom Rides Today" is the theme of this year's celebration hosted by the People's World. A panel discussion featured Lula White, a retired New Haven teacher, who participated in the Freedom Rides from Chicago while attending college; New Haven high school student Kendra Streater and Hartford high school student Vyctoria Viera, immigrant rights activist and union leader Ricardo Heriquez and State Representative Gary Holder-Winfield. Prizes and recognition certificates were awarded to participants in the high school arts and writing competition, "How can we build on The Dream for ourselves and the next generation?" Drumming was e performed by Brian Jarawa Gray. Over 50 people gathered Sept. 24, 2011, at the New Haven Peoples' Center for a "Youth Jobs Roundtable," where high school students, leaders of student organizations, local politicians, community organizations and labor organizers put their heads together to launch a campaign for good jobs for youth in New Haven. The president of the Black Law Students Association at Yale, Alderwoman Dolores Colon from New Haven's Sixth Ward, a representative from Connecticut Students for a Dream and labor leaders from AFSCME and the teachers' union were all in the room. Nollysha Canteen and Sabir Abdussabur, both high school student leaders, MC'ed the event. Several youth, including Abdussabur, gave testimonies from the front of the room. Joelle Fishman of the New Haven Peoples' Center gave a keynote speech, providing hope and a rallying cry to support Obama's American Jobs Act and Jan Schakowsky's Emergency Jobs to Restore the American Dream Act, pointing out that these bills could create over 5,000 new jobs for youth in Connecticut. Capria Marks, a student at Common Ground High School and community activist, presented the suggested plan of action for the group. She called on each person present at the meeting to collect signatures on a petition for the American Jobs Act and the Schakowsky Bill. "Don't fold up this piece of paper and put it in your pocket," said Marks, "Repeat after me: Please get this signed!" Marks encouraged all those present to organize for a Youth Jobs March Nov. 2. 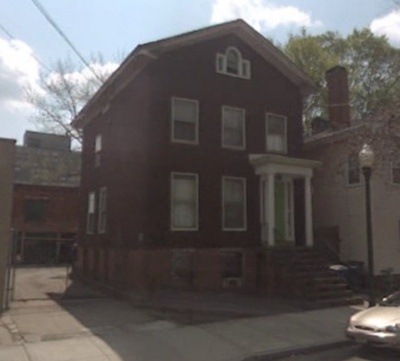 August 25, 2012, a "group of veterans" called on Governor Dannel Malloy to restore the request for funding for restoration of 37 Howe Street, site of the Communist Party USA's New Haven People's Center. The Governor removed the item from the state bonding budget after an opposition group from outside New Haven, citing their veteran status, protested the proposed funding on the grounds that Communists are part of the building. The bonding request would restore brick work on the 1851 Italianate structure which is a site on the Connecticut Freedom Trail. The announcement was made as the New Haven Peoples Center celebrated its 75th anniversary with a family backyard cookout and cultural event including music and children's crafts. After supporters crowded on the front lawn for a group photograph, messages of solidarity and support were delivered by elected officials, labor leaders and community activists. We call for the restoration of the request of the New Haven Peoples Center for funding. Joseph Dimow, World War II Veteran, 29th Armored Div. This page was last modified on 30 June 2015, at 00:16.